There are many ways to wear long locks. If you are looking for inspiration, surf our collections and find out the best haircut that suits you. A full head of long strands is a sign of healthy living. While the genes can contribute to the growth of your hair, it is often a hard task keeping the locks in good shape. 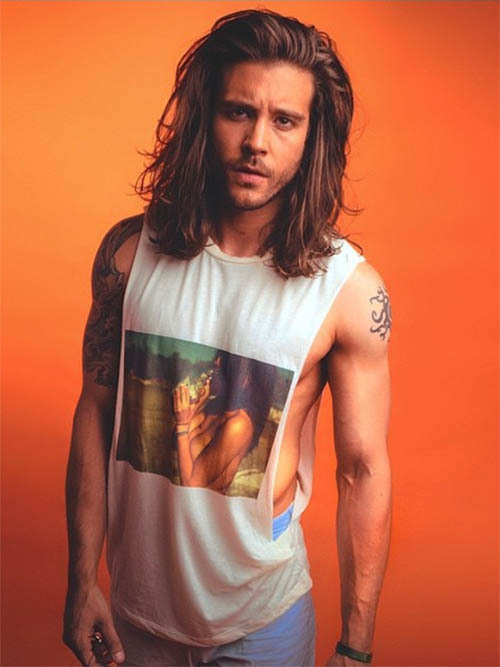 While not all men can enjoy the classic looks of styling their locks, only a few with long hair have the opportunity to choose from many styles. Grooming the hair is not just for the women but enjoys the patronage of men. You can pull off great looks when you style your locks in the right way. 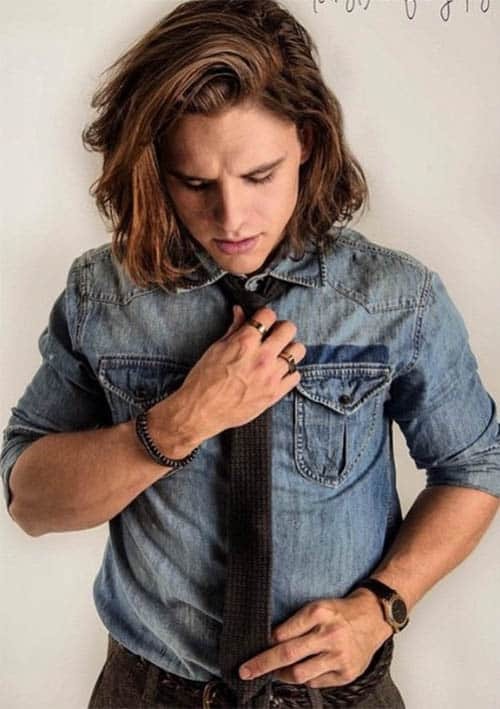 From styles that reach the back to manes that get to the shoulder, long hairstyles for men are worth every styling they get. If you are inspired to style your long hair to that of Tom Cruise and Brad Pitt, here are 45 effortless styles to opt for your locks. Perhaps there is no sweeter feeling than being the envy of everyone. When long strands are at your disposal, the world becomes your oyster. For some touch of style, you might consider putting up the swept mane. To achieve, wash and dry the hair. Then, with the aid of a styling product, run your fingers through the strands and sweep the larger portions to the side. Sweeping the hair to a side to create a unique look is not just for the sides. There is actually some touch of the sweep style when the soft layers at the top. 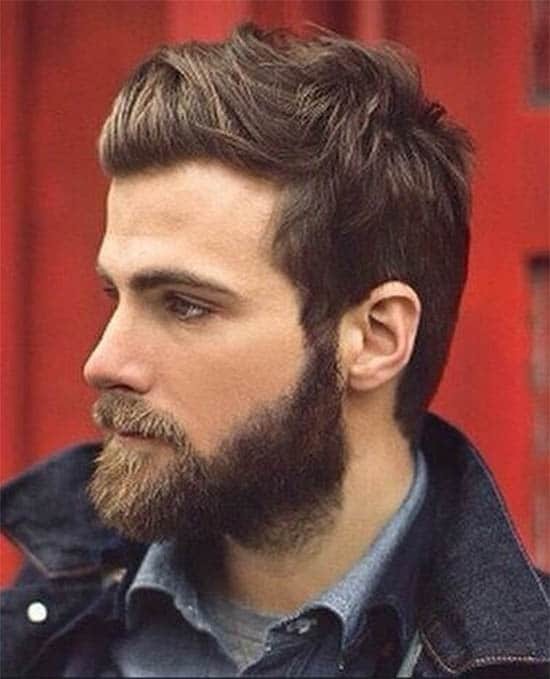 It looks good if it is within the ambient of the shoulder and spot a well-trimmed beard to compliment the look. 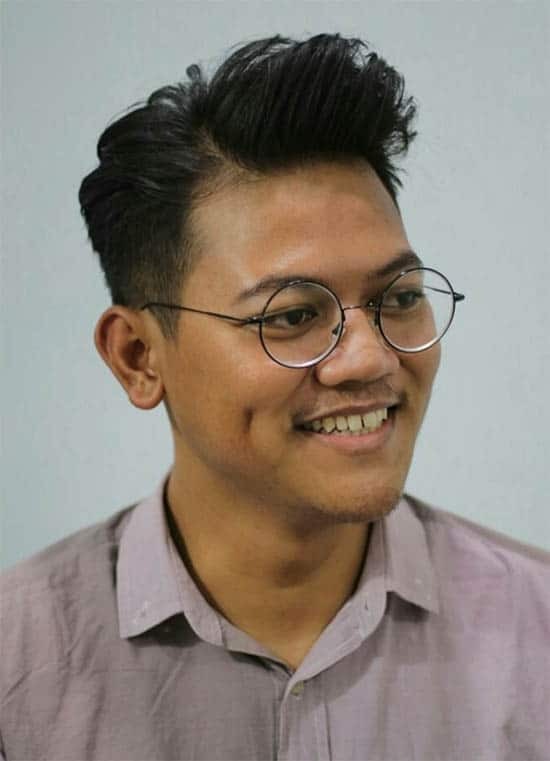 The fringe haircut is a clear depiction of the long hair. It is the model for stylish long locks and you can make the most out of this. Consider styling the fringe to the side and applying low fades at the sides. This is the dream of some stylish men – having long locks. 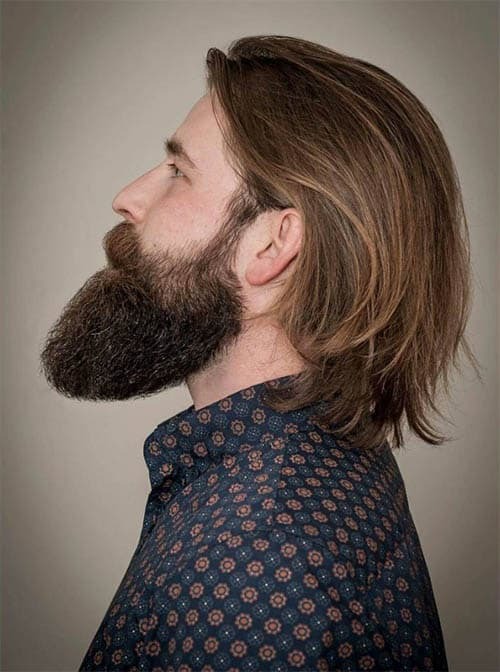 However, the shoulder-length haircut is for men with thick, full hair. With warm water to wash the strands, a blowdryer to blast the wet locks, and good stylish products, you are sure of maintaining the locks without a messy finish. 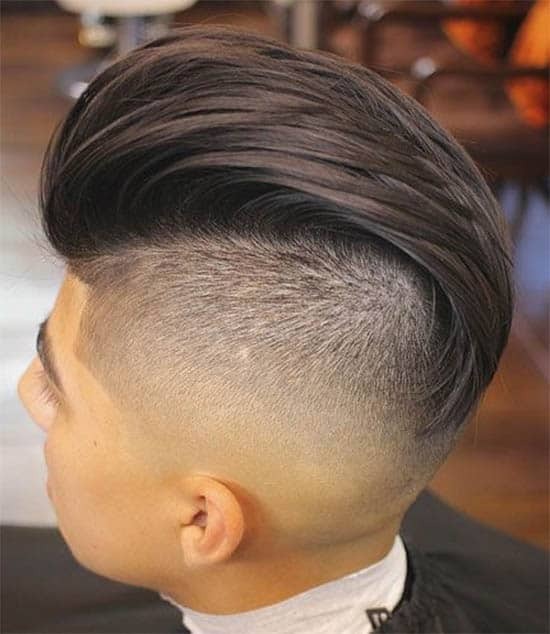 The trendy pompadour is another perfect styling to the long hair. 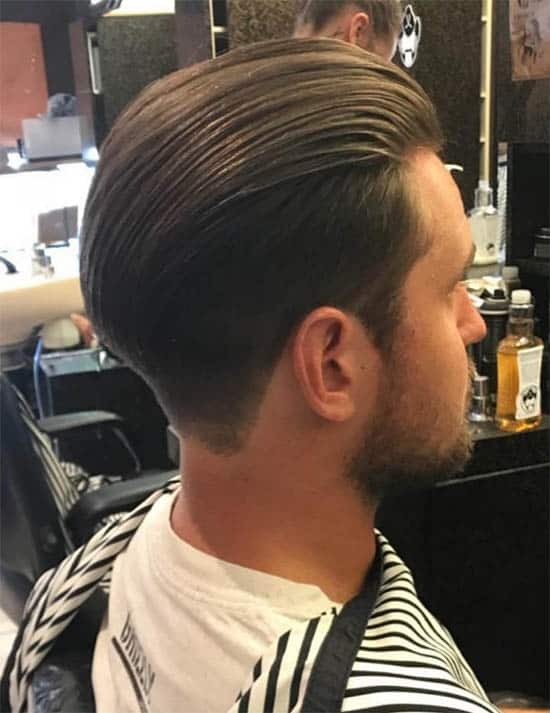 While this might not feature in the long strands dropping to the shoulders or tied as a bun, you can be sure to get a thrilling finish when you rock a pompadour with waves. With a styling product, run your fingers through the hair, and comb back into a pumped up pomp. The bun hairstyle has been in dominance by the female folks. 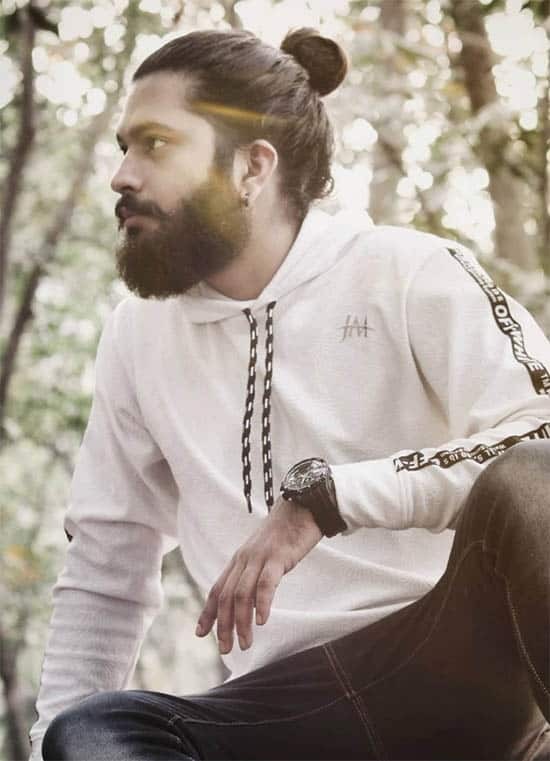 Now, men with long strands to show off can give them a run for the money. 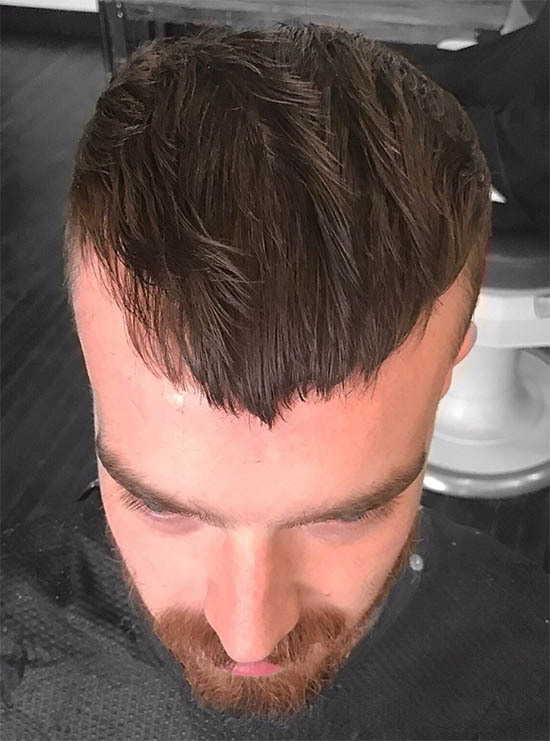 With the help of a skilled barber, work the strands into two distinct variations. First, you will be looking at getting a bun. You are a man! Do not let it stand at the crown but stretch it further to a mini ponytail and twirl to a sloppy knot. There is never a limit to what you can achieve with many locks to spare. What we have here is a tri-haircut. 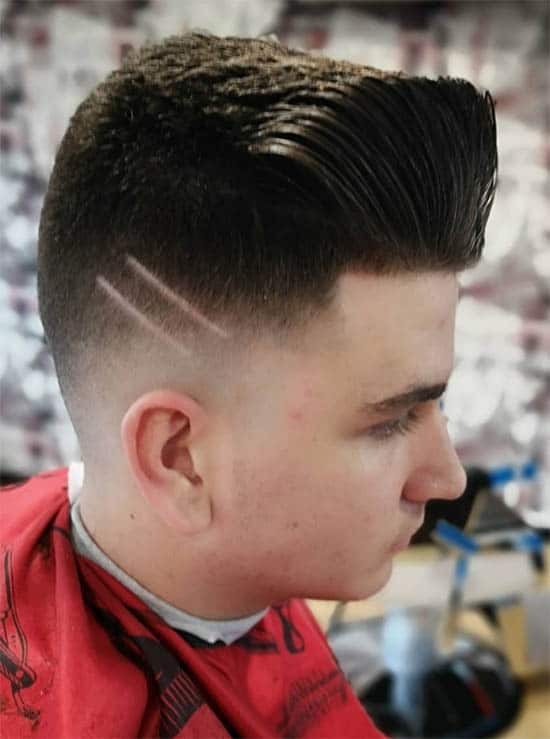 First, get the barber to style the hair to a V-shape – this should stop a little below the crown. Next, start a braid from the nape and extend halfway up the head before tying into a bun. The endowment with thick, long locks does not imply your styling messy hairstyles. While the voluminous strands can interfere with the success of a clean cut, you can try some variations. One of such is the side swept hair with an undercut. 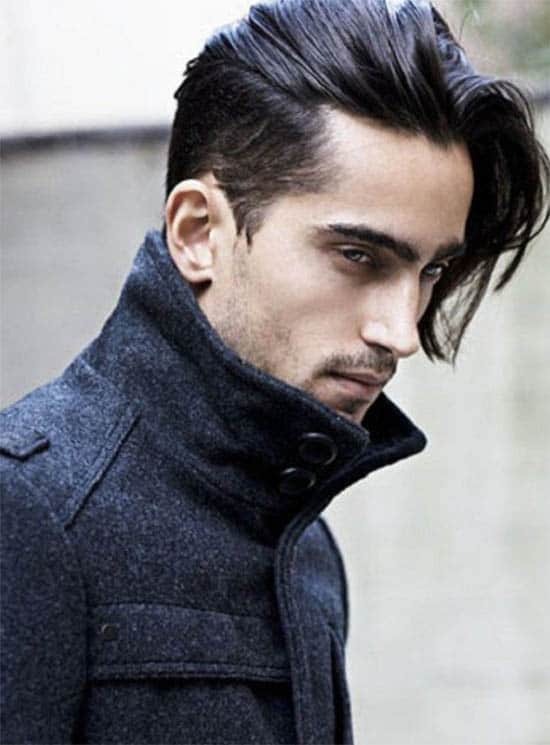 Keep an undercut at the sides; a medium haircut just above it and style the wavy locks at the top to the side. 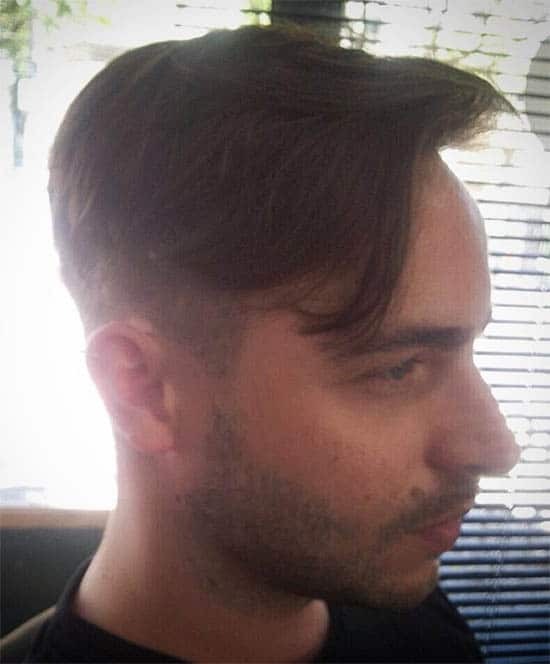 When the side part features in a haircut, you can be sure of getting a great look. 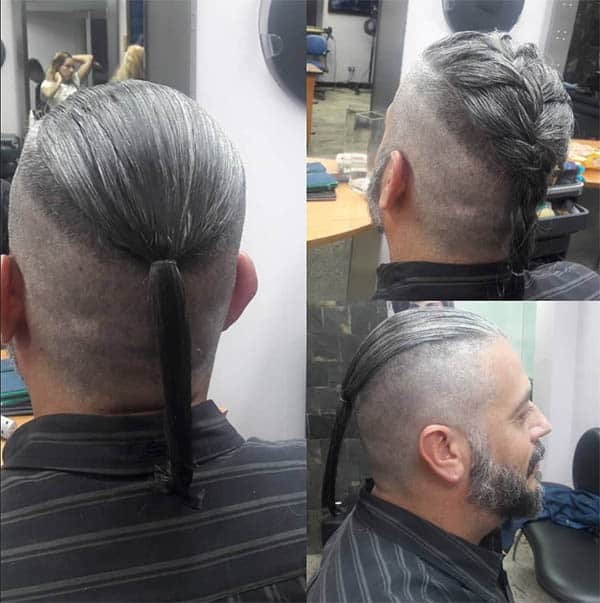 To achieve, get the barber to trim the locks a bit. Next, tapers the sides; sweep the long top to the side and add a razor line for a perfect finish. All the locks do not necessarily need to be in the public eye. A bit of styling features here when you slick back the strands. It will be a good idea to apply a good styling product before this. After, taper the sides for a clean look. You will definitely trigger mixed reactions when you put up this cut. The women will certainly call for your head because the style has been in their domain for long. The cornrow is a nice way to style your long locks without getting them messy. Depending on the structure of the face; six (6) braids will be just fine and a clean short cut at the sides will add glamour to the look. 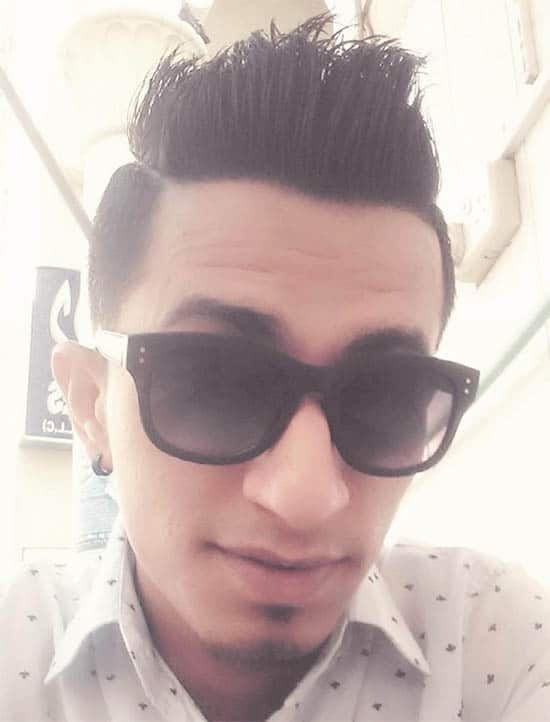 We all know that the Faux Hawk is the style for men with longer locks. 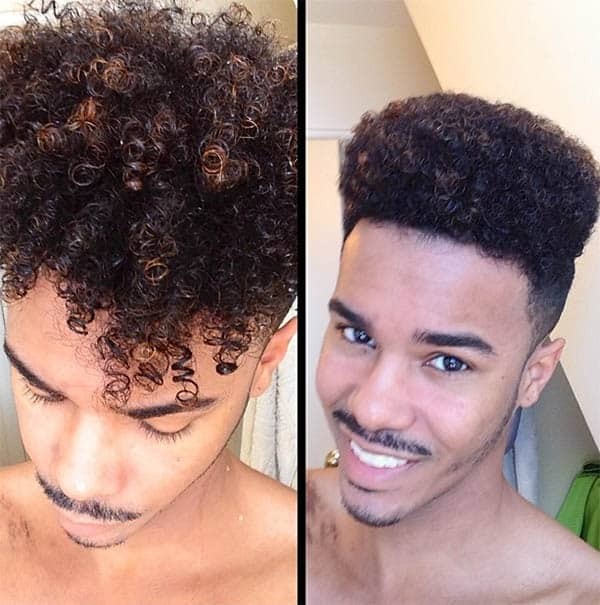 When it comes to this, consider styling your curly locks to the front and keep low fades at the sides. 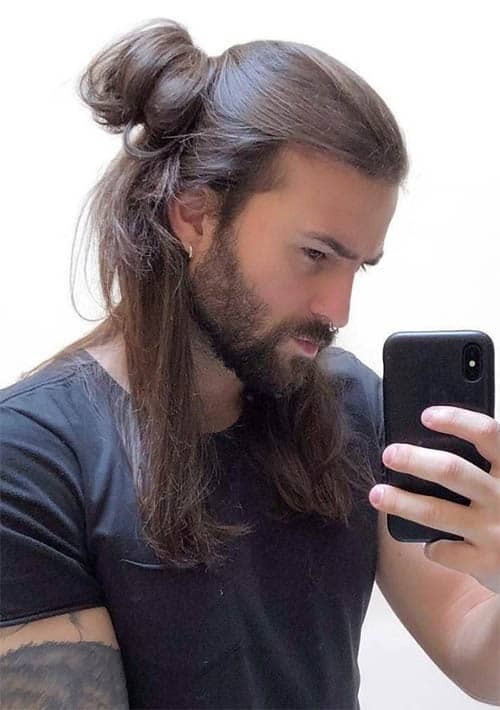 To avoid competition with the woman, go for the man bun. 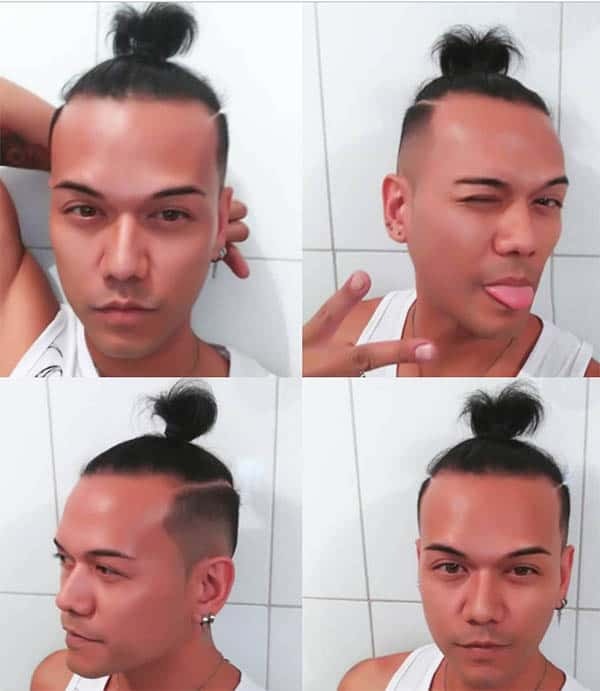 While it keeps you in the lane of the stylish man, you will be maintaining a sleek cut that will outshine those of the competitor’s – the women bun. 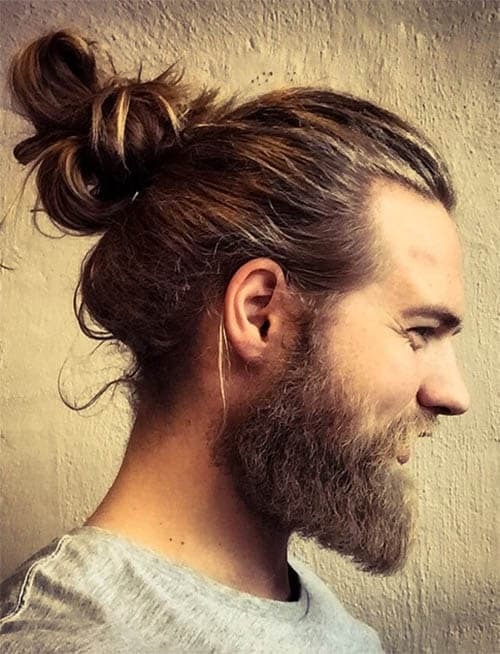 The curly bun is a good deal for men that shave curly locks. 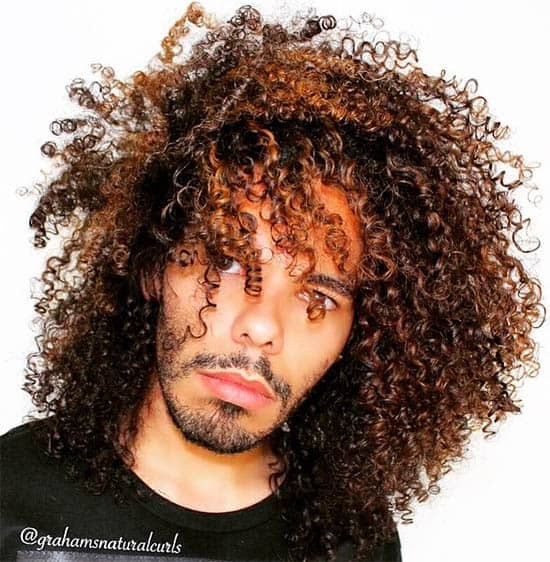 Yes, the classic man burn is for textured hair. 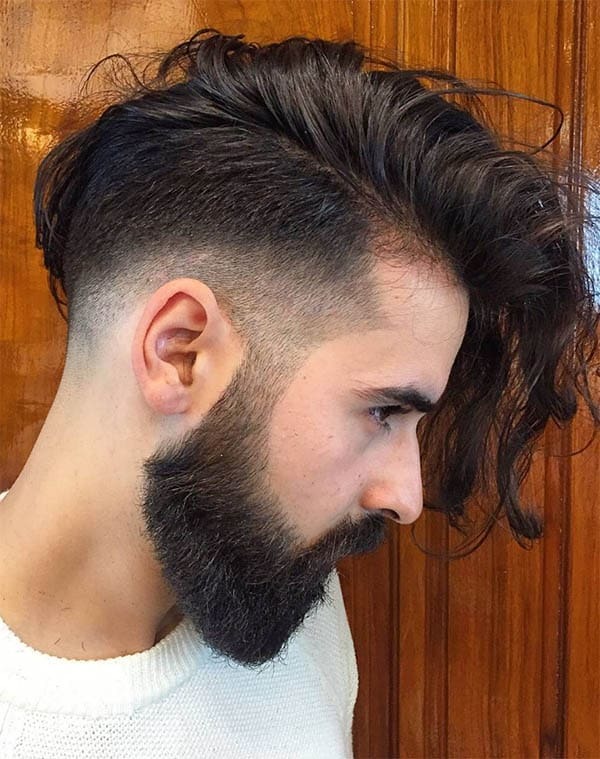 If yours has curls, it is best to settle for this cut. Weave the curls back and tie in a medium-height bun. Get out of the thoughts that ponytails are for women. If you have straight locks, then the sleek ponytail is for you. At the nape of the neck, tie the locks into a low ponytail and throw in some hair products to achieve a nice look. The pompadour has room for modifications. That is why you can afford to reinvent it with your long locks. 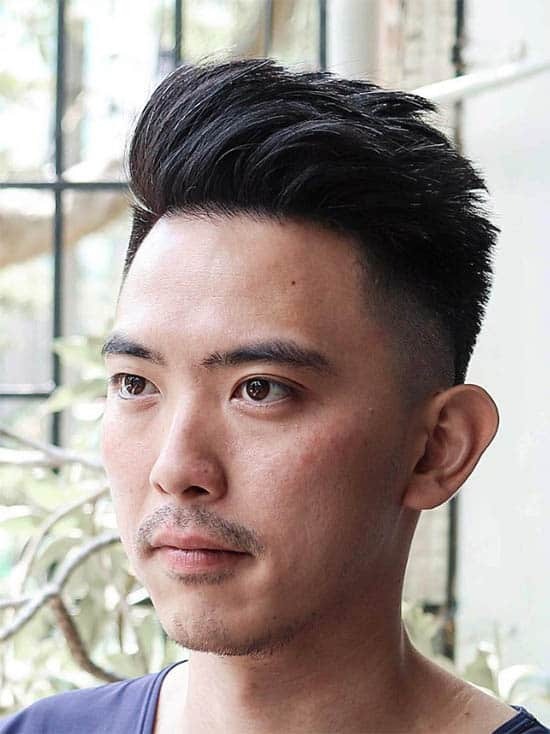 This might not be the classic messy haircut but with the combination of the pomp and faded sides, you can still turn some heads. The side-swept haircut looks nice for voluminous strands. If this must come off great, then consider a low fade at the side before tossing the locks to the side. While you can make the most out of the classic and curly buns, the braided bun can also make a lot impression. With undercuts locking at the sides, tie braids towards the scalp and pull them up into a high bun. It is true that most men do not have blonde locks. However, if you are looking at throwing in some color to your long strands, then it is time to set it going with a blonde braid. With the right hair product, you can achieve that chic look that is popular amongst women. Some men would prefer tied locks than pulling the same down to the shoulder-length. 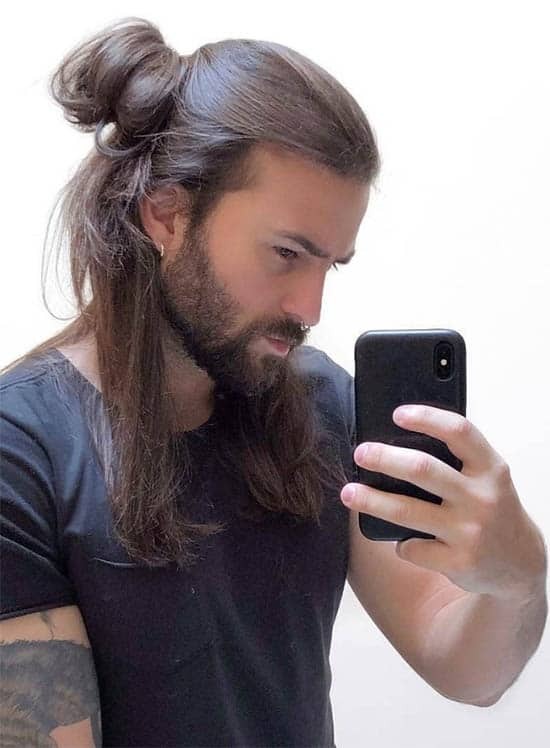 If you fall into this category and you want to recreate the same, sweep back the thick locks and secure with a headband. 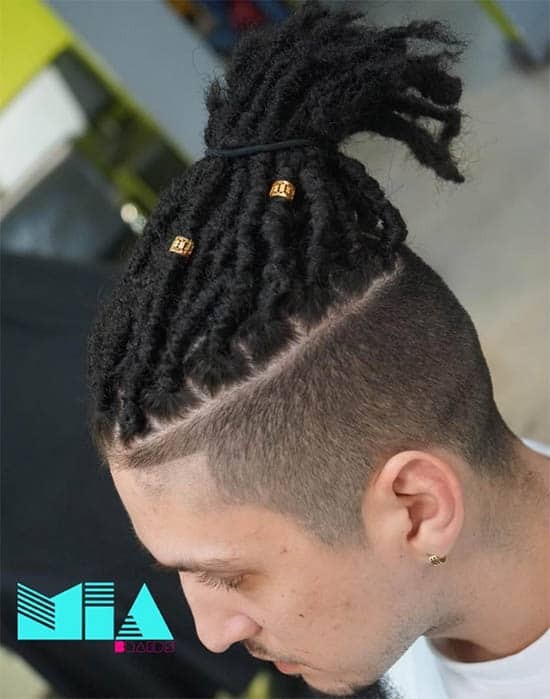 The dreadlock is one of the haircuts that readily come to mind when making a list of long hairstyles for men. Not only will you be keeping the locks neat, but you will also be the talk of the day when you tie up the dreadlocks. The messy haircut features the bun for a perfect remix of the thick locks. The undeniable appeal of the bun style reinvents with its styling into a messy bun. 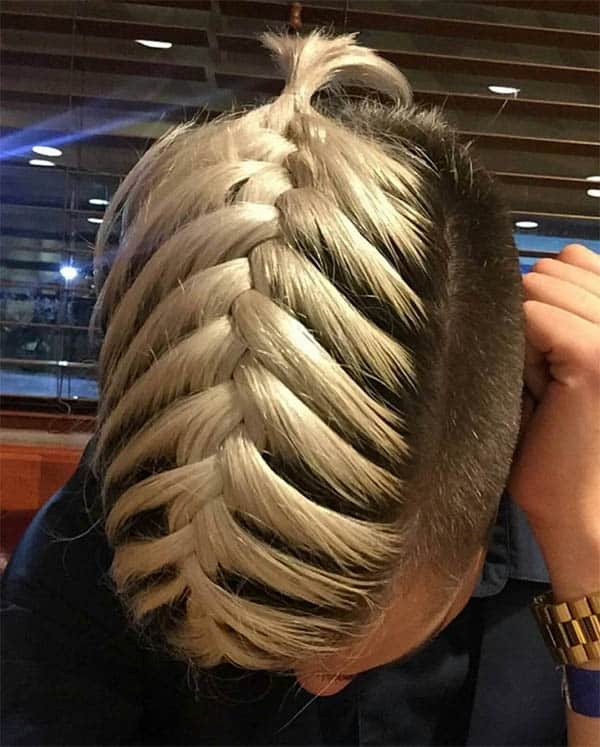 You will certainly come out looking good after styling this. The spikes do not have to come close to the front to make an impression. With long locks in your favor, you can make a many impressions. It will be nice if you texture the locks and keep fades at the sides. It is a popular notion that the pompadour style never goes out of style. 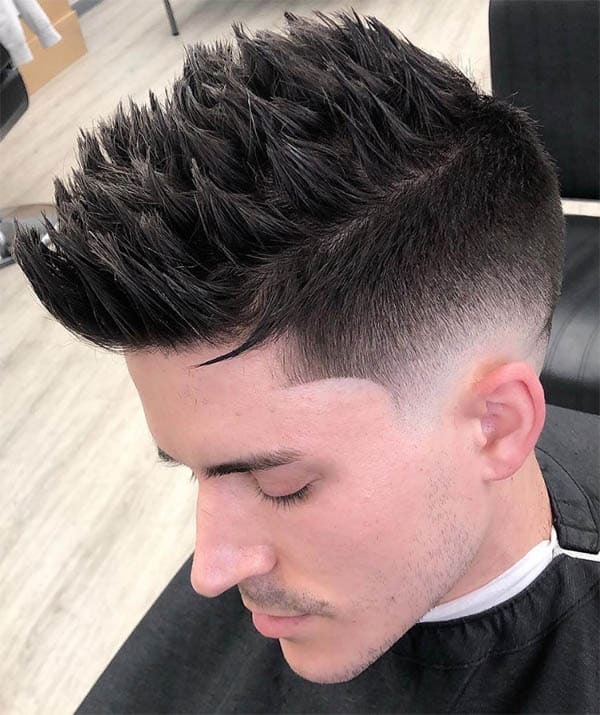 With voluminous locks in your favor, consider shaping up the front to a pompadour and completing the look with side fades. While some men have wavy locks on a platter of gold, others make up for it with styling products. If you have wavy strands on your locks, it is time to style them into an impressive sweep back. This is the definition of class and style. This style lies between the full and short buns. Unlike the other two, the tip of the locks does not twirl inside. Rather, it sticks out and you spot sideburns to complement the look. The fades meet the curls for a long haircut union. 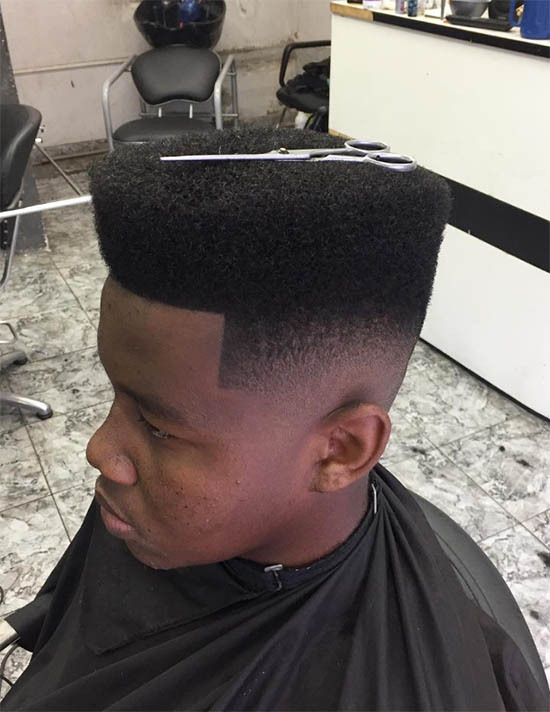 There is no denying the fact that the locks with some texture make a nice look when a high top fade features in the game. The comb-over haircut is always in a battle to outshine the fringe. However, the stage is set for it to coast home to victory. 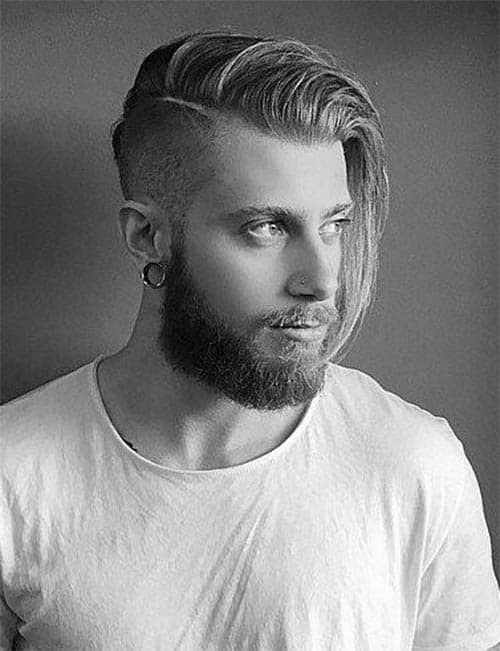 With a good touch of the undercut, you can get the thick locks tilting to a side. If you are not at home with the messy comb-over, the longer version is there for you to try. It entails maintaining a volume at the top and tilting to a side. Meanwhile, fades can feature at the sides. The pompadour hairstyle opens the door for different styles to feature. This time, the door is open to style the haircut into a presentable look. With some texture in the locks, prop up the front pompadour and complete with side fades. The fringe haircut is no doubt, a nice way to drive home your taste for long hairstyles. 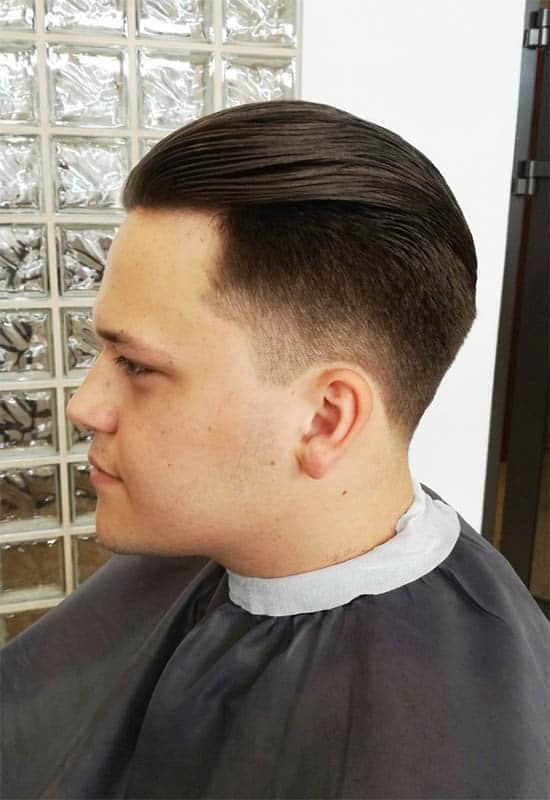 While this might not be in the league of the volume you may be looking for, the long textured front sweeps forward and gets a clean look with fades at the sides. The side part is coasting home with the impressive feature it adds to the shoulder-length haircut. 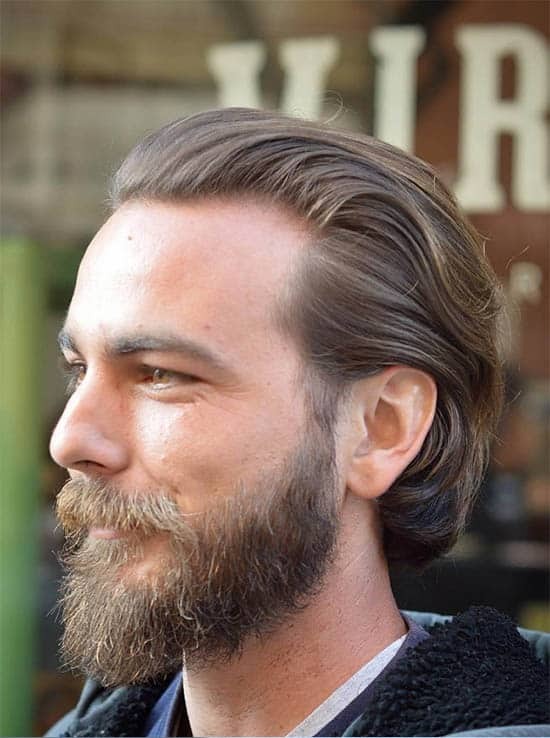 To achieve this, sweep over a larger section of the locks to one side and add a deep side parting. This is the women’s special but a classy man has a chance at it. 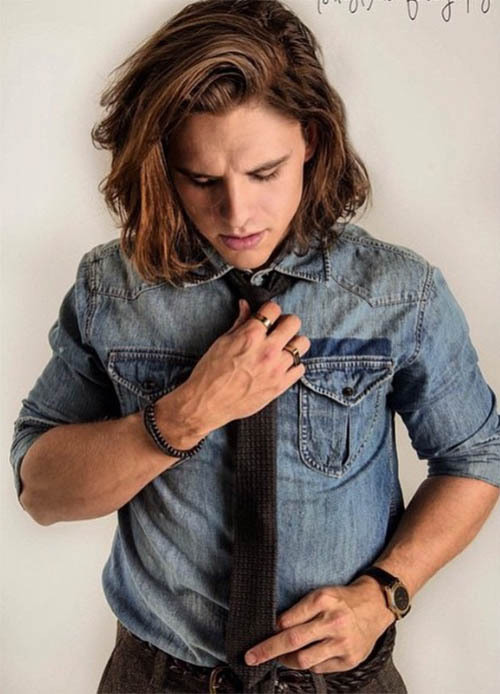 With a good shampoo and other styling products, you can pull off this look. 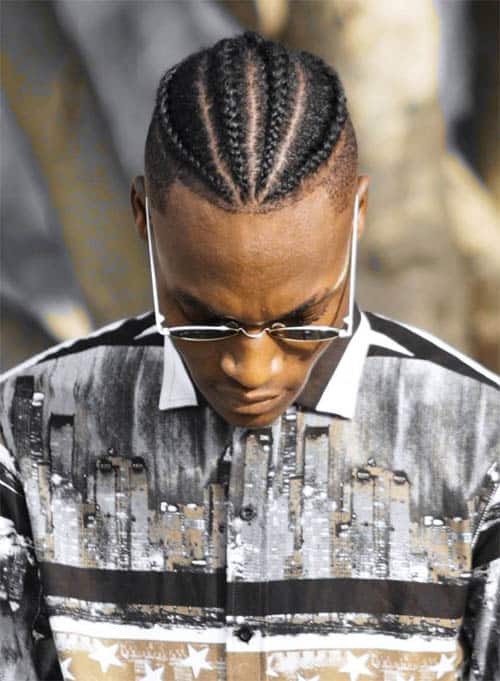 The feminine style becomes the men’s when they put up a French braid with neat rows. However, this is dependent on your facial feature. While four rows will be just good for one, six will be perfect for the other. With your hair stylists’ advice, choose the one that befits you. 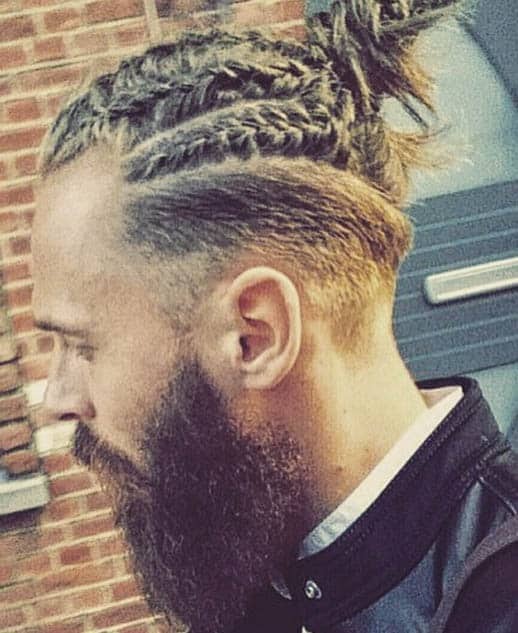 The slicks are taking another shot at the long hairstyles for men. With some waves at the top, you can pull this great look without hassles. 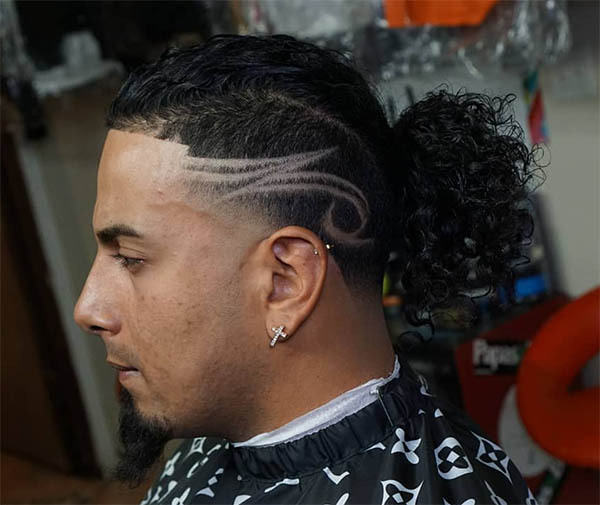 Many locks give you the opportunity to vary haircuts. 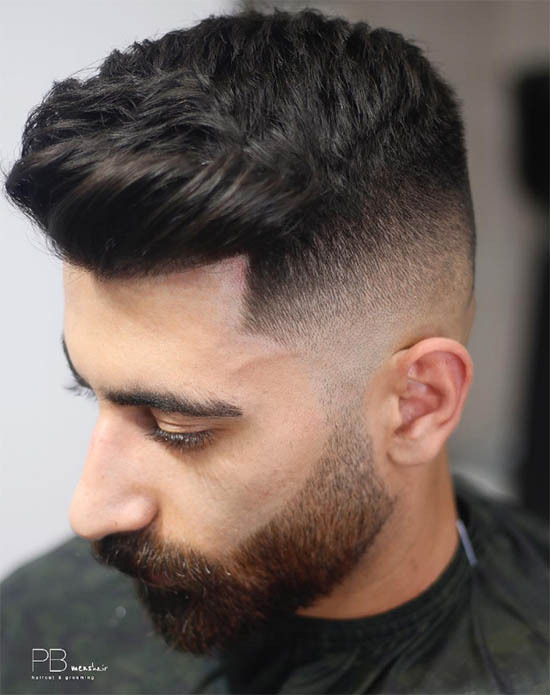 When the high fade features in a style, there is no denying the fact that it will be good. 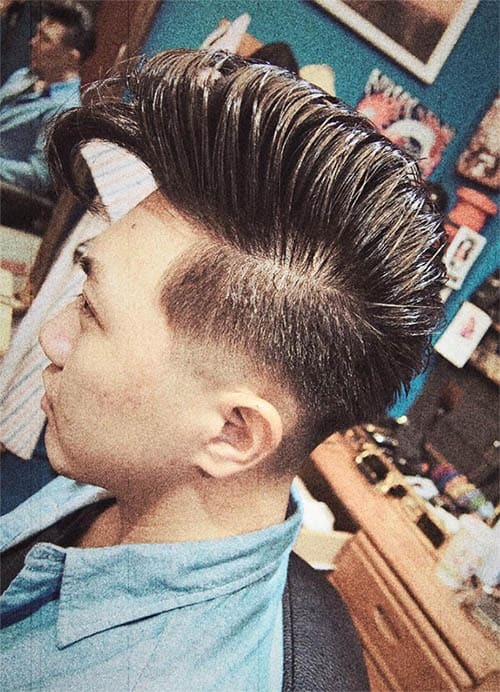 With the pompadour, the style can take a definite shape. 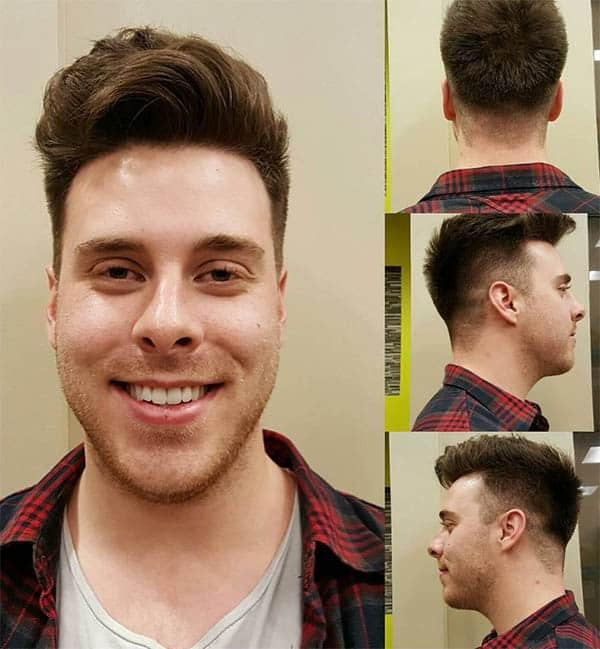 Style the pompadour to a medium length. 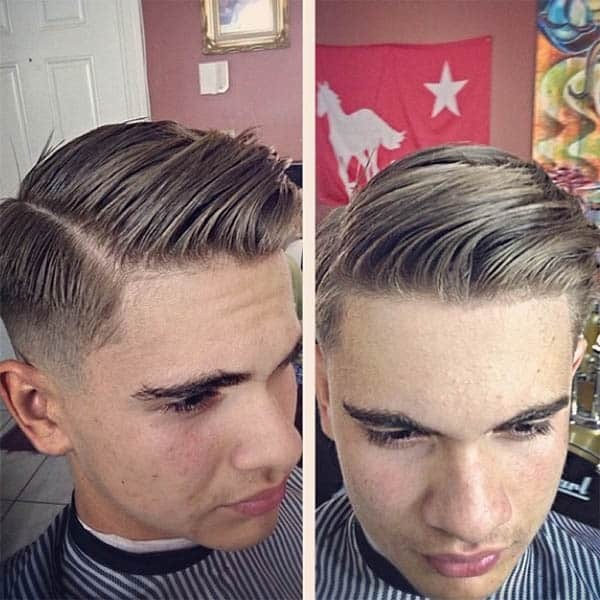 Next, put up low fades at the sides and medium fades just above it. With a good wax product, you can pull off this look. 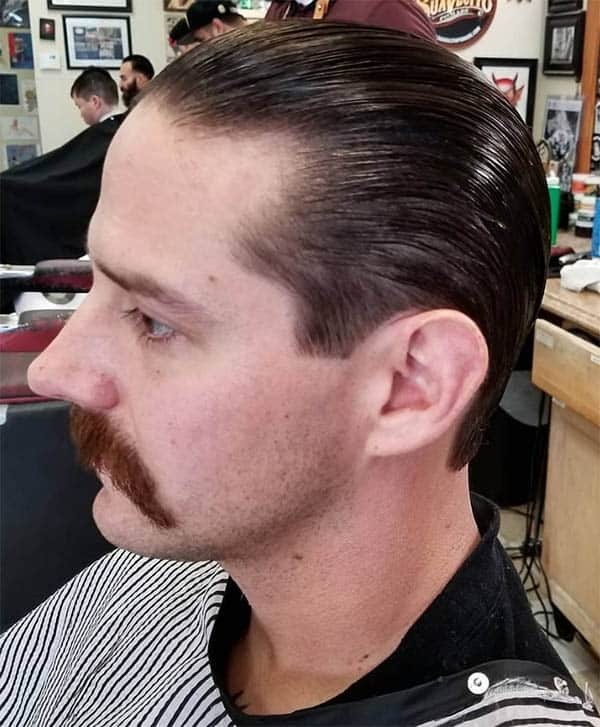 The traditional slick that runs down to the nape can take different forms. With a matte finish, you can roll the slicks from the front, through the crown and down to the nape. For the man with an oval face, the flat top is a great way to style the voluminous locks. 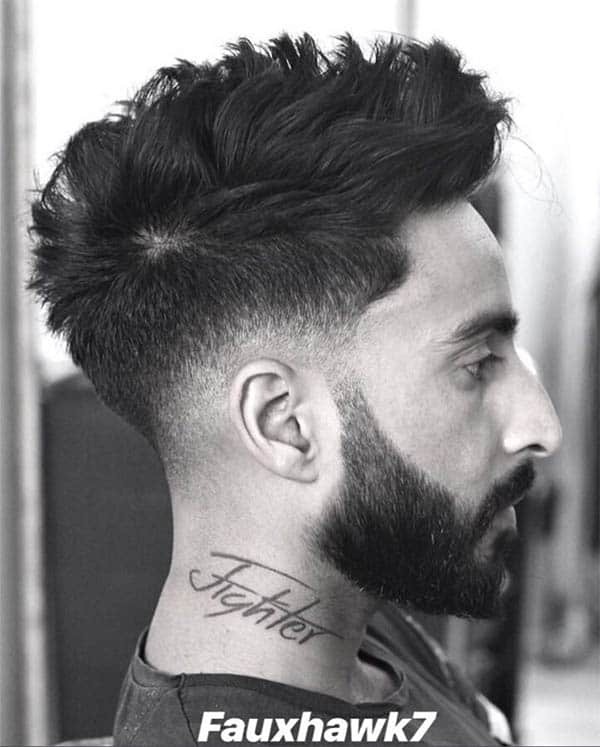 With a complementing fade at the sides and a nice trim at the top, you can pull off a nice look. Adventure is the name of the game and those who are willing to swim the ocean of stares can go for the front textured bangs. This style is quite intriguing and can readily arrest the attention of every onlooker. The bald fade has never been this unique on a haircut. The slicks move from the front and come home to roost midway before the nape. Next, the bald fade applies from the sides and the nape of the head. 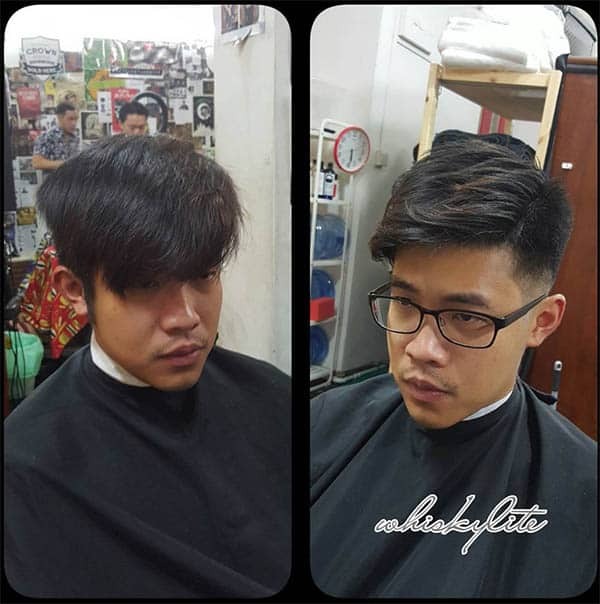 There is never an end to what you can achieve with versatile haircuts. The spikes incorporate the pompadour hairstyle to create a distinguishing look on the wearer. There is no need to style the voluminous top when you can add just a few touches and look great. With the locks sticking out at the sides and the bangs at the top resting few inches from the forehead, you are sure to create a rough look. The popular comb-over haircut makes another impression with the classy touch it offers. Now, instead of piping low, it stands a few inches above the head. The forward roll creates a distinct look. 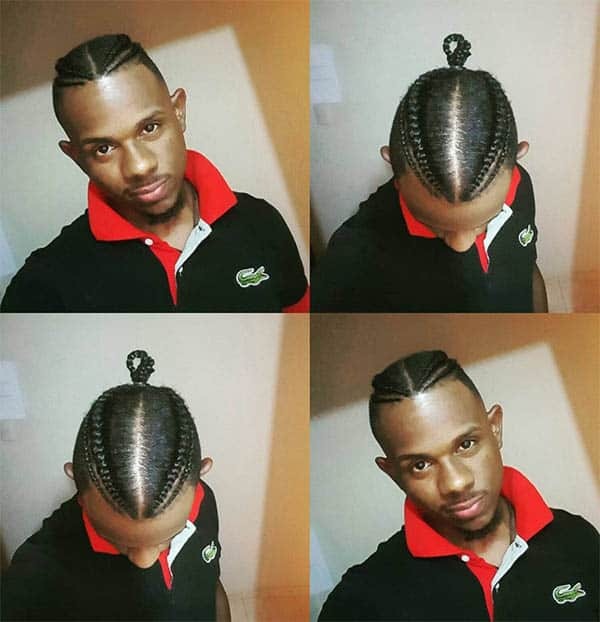 This is a great look to pull off but the barber must be ready to put his skills to use. With well-trimmed strands from the crown, the front rolls forward into the forehead. 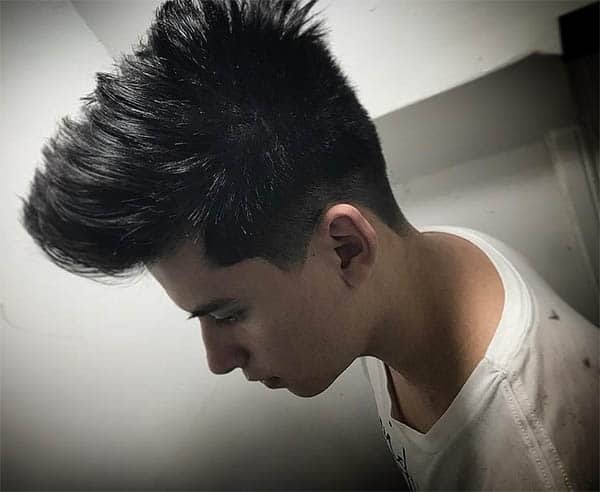 High fades at the sides and probably a surgical part will add color to the style. Having longer locks without inspiration to get it styled is not a good idea. Get into the game and become the classic man with any of the trendy haircuts in our list. 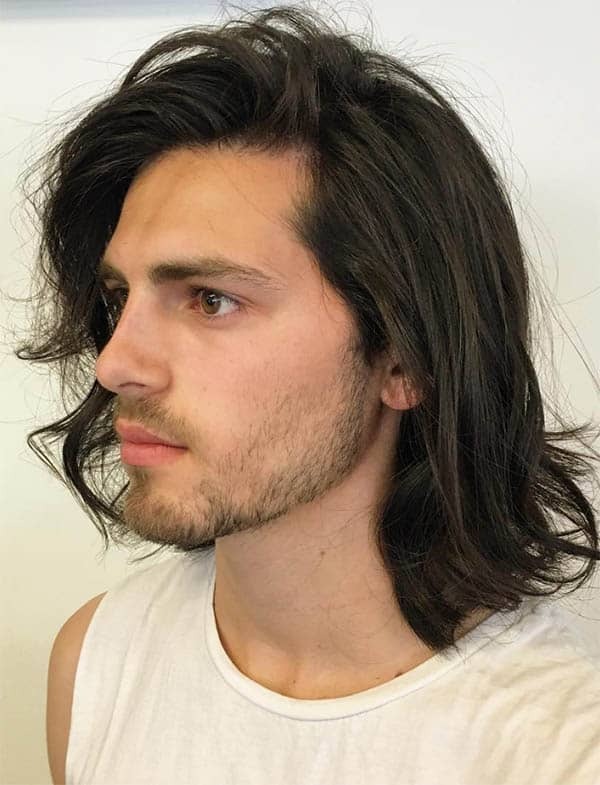 Long hairstyles for men are open to innovation and you can think out-of-the-box for another unique style. Your longer lock is a buoy for you to try more adventure with your haircuts. 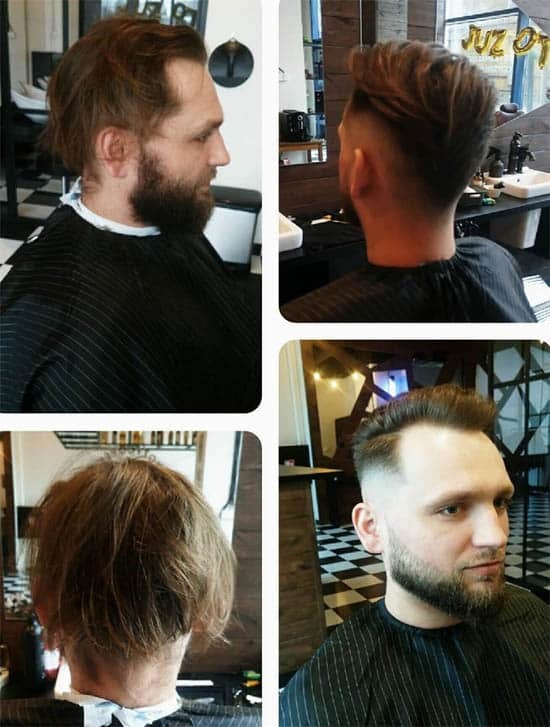 Dare for more and get a trendy look after visiting the barber.